Experience unparalleled natural beauty from the infinity swimming pool at Villa Ganesh on Choeng Mon beach, Samui. The dazzling ocean water and the surrounding lush foliage represent only the tip of the iceberg. From the three poolside bedrooms and lavish poolside veranda to the modern living area, guests are in for the experience of a lifetime at Villa Ganesh. Choeng Mon beach is a popular area known for its restaurants, bars and beachside cafes but there are so many things nearby including Chaweng and Big Buddha Bophut that you can truly place each day in Samui just within your immediate surroundings! 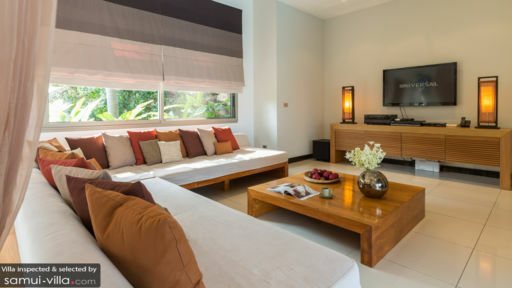 There are three bedrooms at Villa Ganesh with individual design featuring sun-kissed or ocean-blue walls, selective artwork, vibrant bed runners and plush, king-sized beds. Each of these bedrooms is air-conditioned to give you a more comfortable ambiance to retreat to after a long day of adventures. The rooms are equipped with ample wardrobe and storage so you can keep all your belongings with ease. The best part about the bedrooms are the glass doors that lead you to the poolside so you can enjoy an early morning or late-night dip in the pool without obstruction. All the bedrooms have spacious ensuite bathrooms and the master bathroom has a lavish sunken bathtub as well as a walk-in shower area. Like a strip of untainted clear water that spills onto the ocean, the infinity swimming pool is easily the most exciting part of Villa Ganesh. Lounge on the sun chairs found on the pool deck to enjoy the unobstructed view of the ocean. A few steps can take you to the veranda that is perfect for evening cocktails to watch the sunset and the sky shift colours from golden to an alluring mauve for the most magical end to your day. It has a comfortable sitting area and a dining area alfresco-style. 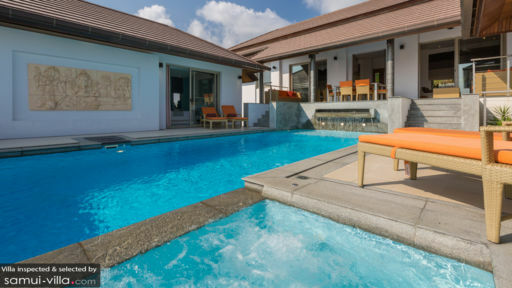 Although a modern space, there are elements of Thai heritage reflected around the villa with a stone-carving of Lord Ganesh by the swimming pool, warm orange tones, natural wood furniture and lanterns that add whimsy to the spaces. The living area is beautifully-designed with a luxurious sectional sofa laden with umpteen cushions in autumnal hues, a large coffee table and an elegant entertainment console with a flat-screen TV and DVD player. Sheer, blush pink curtains and blinds help to filter out the sunlight for a soft, easy-on-the-eyes alternative. Adjoined to the terrace, the living pavilion is shared by the dining area and kitchen separated with the help of soft, sheer curtains that add a gossamer ambiance to the room. Seating for six allows everyone to eat together for an intimate dinner with loved ones. Fresh flowers decorate the table that has been set with fine crystal and tableware. The open kitchen is western and designed with top of the line fittings and appliances for your ease. Villa Ganesh is equipped to serve your every need and look after the daily chores as well such as providing 24-hour security to guests, housekeeping and pool maintenance. For certain services, you can request the staff to make necessary arrangements as these are charged additionally. These include massages in-house, car / scooter rental, airport transfers and others. Surrounded by white sand beaches, endless turquoise ocean water and the tropical sun will put anyone in a good mood. 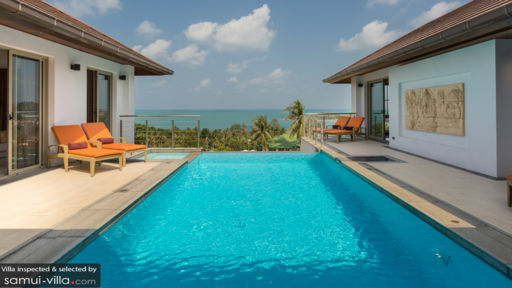 Villa Ganesh provides you with easy access to some of the best places in Samui such as Chaweng beach, Big Buddha Bophut and beachside dining to name a few. Places like Treetop Zipline and Canopy Adventure are perfect for an adventurous day with the kids. Restaurants and bars include [email protected], Secret Garden and Happy Elephant.